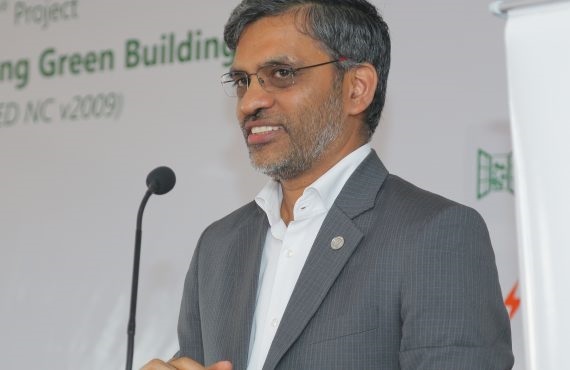 Mahesh Ramanujam , President and Chief Executive Officer at the U.S. Green Building Council blessed the Occasion by his presence and it was a great moment for our green building to receive the honor from an eminent person like him. Good afternoon everyone. It is Good morning we are almost getting into Good afternoon. I will take a deep breath, particularly Mrs. Rema reading my profile right in the heart of my homeland in Tamilnadu, where I have been invited by SIERRA to give my first plaque presentation in my home state, Tamilnadu. This is going to be the first presentation I’ve done, am truly humbled, honored, inspired and I have no more words to express my gratitude to Mr. Sundaram, to Mr.Karthik, Mr.Giridhar, Mrs. Rema Giridhar – for your very kind introduction, and importantly being in the company of distinguished guests, I don’t want to list all the names because I will get into trouble, I will leave some names. I would say, today it is my unique opportunity and a life-time privilege to be among the family in ‘Namma Coimbatore’. I don’t want to talk a lot about this building, because you heard that all in the story, so I won’t do the job of adding anything to it. But what I will talk about today is, about why it matters and why we have a unique opportunity to reflect a different image about what we do as Indians, as pro-Tamilians to do a greater good for the greater world, so just a quick introduction. It talks about the Second highest ranking Green Building. So what I thought was very important that everybody understands what that means. I have a piece of paper and about to read it in a minute. It’s got 5 things at the top and 5 things at the bottom. I showed this to Mr. Giridhar when I walked in. First U.S. Green Building Council was founded exactly 24 years ago, 1993. I graduated from Annamalai university in 1993. 24 years, so next year is Silver Jubilee. Second, LEED which stands for ‘Leadership in Energy and Environmental Design’ was established in 2000. It is a 17-year old program and it’s running every single day. Very simple way of explaining it is, if you go to the grocery store today you pick up any food article you are consuming, you will see an ingredient nutrition label listed on it. You are going to l see how much sugar or how much fat, what are the ingredients in there etc., etc., so you are very familiar with the nutrition label on food items. LEED is the nutrition label for a building. Why this matters is because two things contribute to maximum carbon emissions in the world, one is building, another is transportation. So 50-50 somebody says, 45-45 somebody says 40-40. Still these are big numbers 40% of Carbon emissions is projected to come from buildings and we say it is important before we focus on this sector and create LEED as a framework to do better design, better construction, better corporations and most importantly better performance of a building, because initially in the olden days we just used to build because it was available. But now you build with lot of thought, that’s what that video talked about. It is about applying thought, it is about applying vision, it is about refocusing on all the concepts that are known to make it an efficient building, efficiently designed as a building that takes less from the environment and gives it back to the environment. So that is LEED, I just want to put that. Now let me tell you the 17-year old story. The 17-year story is 90,000 projects are attempting LEED all over the world. So you can look at the empire state building in New York city, you can look at Shanghai tower, you can look at Taipei 101 in Taiwan. You can look at the tallest buildings in Paris, London and Beijing in India in Mumbai, Bengaluru, Chennai we have varieties of buildings that have achieved LEED Certification around the world. 90,000 buildings around the world totaling the total square footage of 19 billion square feet present in 164 countries. Now Let’s talk about the second. Second among the 90,000 buildings. That is inspiring. I didn’t imagine that it will happen in my hometown. So let me talk about, in India there are 5 buildings, I am going to talk about the top 5 buildings in India from a scoring point of view. If you know, this is a season of admissions, so let’s share some scores. This building is the number 1 in India, that’s very important because whenever I came second my father always asked who got the first. SIERRA ODC facility got 103 points on a total of 110 points. This looks like CBSE Results. But then in the top 5 buildings, let me talk about the other buildings in India which came next, so that you have a context of what these buildings are. The second building was ITC Green Center, Gurgaon. The third building is ITC Hotel Maratha in Mumbai, if you have visited Mumbai, it is a beautiful hotel. Again the ITC Green Centre certified again, so it is in 4th. The next one is ITC Rajputana Sheraton hotel. So if you really look at it, it puts you on a very elite club, because ITC, you heard the news from Mr. Nakul Anand, that company transform division is called ‘Responsible luxury’. That vision was set and I am hoping SIERRA’s tag name is going to be ‘Responsible everything’. Then from a world point of view, the number in the top 5 buildings is, one building in Dubai, one in Australia, of course one in Tamil Nadu which is SIERRA, one in San Francisco, California and one in Korea and of course, one in Gurgaon. So 2, we got the top 2 sitting right here in India, thank you for making that happen. I was given 3 minutes it is hard to do this in 3 minutes. But, what I want to share is as an Indian, who sits outside India in Washington DC, two blocks away from White House, It is extreme privilege for me, that I can look at India from a different lens than most of the people do. It is a pride of India and I am very very glad that we are not just seen as people who are exporting software, we are also exporting sustainability, and it begins at SIERRA. So with that, I just wanted to, while I was listening, while I was seeing all people coming, greeted, my heart started pumping and I said, I need to say something that is more meaningful for all of us. We need to carry on the SIERRA dream and Mr. Sundaram again, your leadership and your commitment, and as I was telling you on the side, Mr. Karthik did not add another line, called a steel structure. You are also a steel structure. So thank you SIERRA for setting the tone, setting the direction for the city of Coimbatore, Namma Coimbatore to lead the way to be the global inspiration to be the greenest city in the world and importantly starting this culture of sustainability to be exported out of India, so this can become the nation’s pride. With that, with all humility, thank you for your leadership, thank you for your inspiration and most importantly keep the good work going.